It's no secret this heat takes a toll on all of us. But what about central Georgia's farmers? 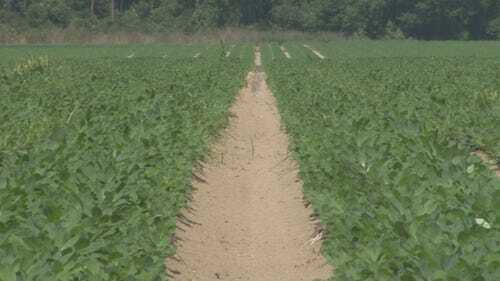 Video journalist Hunter Joyce spoke with a Macon County man about how the high temperatures are affecting Georgia's cash crops. "To me, a peanut plant is a beautiful plant. You know, in some parts of the world, they use peanuts as decoration," says Donald Chase, a farmer who's family has grown peanuts and corn in Macon County for the last 65 years. "Believe it or not, the gnats don't bother me, and I enjoy being outside here and looking," says Chase. "And trying to make a crop do the best it can." A job he says that has become significantly harder in this heat wave. "You plan that whatever challenge your going to face next year might be different than the year you had before," Chase says with a smile. The National Weather Service says central Georgia has been experiencing temperatures about 2.5 degrees higher than average this spring. "Well, if it gets really hot underneath this canopy," chase points to the shaded soil below the peanut plant's leaves. "Then that bloom won't be able to send a peg down into the soil where the peanuts are going to grow. And so, that's the real challenge when it's this hot. That peg will not make a peanut. And that's always a worry." A worry that extends to his corn crop. "Corn really, really doesn't like the heat as much," says Chase. His corn plants require additional watering to keep them cool. "Each day when it's 99, 100 degrees, we're probably getting evaporation rates of 3/10 of an inch every day," he says. He's thankful for his irrigation equipment, something not all Georgia farmers can afford. "If these were dry land peanuts and you get no rain at all, it could be a total loss," says Chase. "We live and die by the weather, that's it." That has Chase praying for some relief. "As farmers, we never want to think about the worst case scenario, we're kind of optimistic creatures," he says with a grin. "But, we could see this weather pattern continue with the super hot days and then, you know, our yields are probably going to be down. That's just the bottom line." Peanuts are resilient plants and there's still plenty of time for them to grow before the October harvest. Chase says Georgia planted large numbers of peanuts this year, so don't worry. He says lower yields doesn't necessarily mean you'll have to shell out more to buy them.